The Brodsky Quartet presents this second volume in its exploration of Brahms’s complete string quartets. The first, which also featured the Clarinet Quintet with Michael Collins, received numerous enthusiastic reviews, The Guardian praising the players for their ‘immaculate’ performance. The String Quartet, Op. 51 No. 1, featured here, was written alongside its contrasting companion, Op. 51 No. 2. Both were finally published in 1873 after having been held back for years by a typically self-doubting Brahms, until he had brought them to his own high standards of perfection. Op. 51 may be regarded as evidence of his concern to revive and reinvigorate a genre, the strong legacy of which went back to the generation of Mozart, Haydn, and, above all, Beethoven. 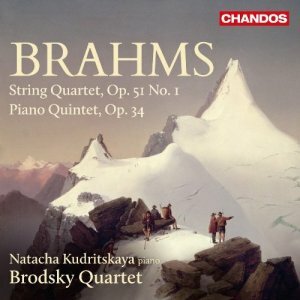 The Quartet is joined by the young, prodigious Ukrainian pianist Natacha Kudritskaya in the Piano Quintet, a more adventurous work: it had started life as a String Quintet, which Brahms then transcribed as a sonata for two pianos. The final version gives as much importance to the strings as to the piano.